Whenever the name Ross Powless comes up, there's a good chance a conversation about lacrosse will ensue. He didn't start playing lacrosse until about the age of 12, but despite his late start in the sport, Powless became quite fond of the game. Ross Powless was a member of both the Canadian and the Ontario lacrosse halls of fame. The smaller photo is of Powless in the 1950s when he played for the Peterborough Timbermen. He was a natural athlete and spent countless hours practising his skills. During his prime he captured a record four consecutive Mann Cups—the Canadian senior men's championships—with the Peterborough Timbermen from 1951 to 1954. He was also a two-time winner of the Tom Longboat Award, annually presented to the top Native athlete in Canada. After his playing days, Ross turned to coaching. His resumé included a Canadian Senior B championship with the Brantford Warriors in 1968 and a Can-Am Lacrosse League title in 1969 with the Rochester Chiefs. Another highlight included coaching six of his sons on the winning Ontario First Nations team that won a national title in 1974. A picture of that championship side had a special spot on Powless' living room wall. But there was so much more than just lacrosse to Ross Powless, the legendary player who was a member of both the Canadian and Ontario lacrosse halls of fame, who died last at age 76. Many deeply mourned his passing, including the lacrosse community, and the people of Six Nations, Ont. where he called home. Nobody knew of the greatness that was due to Alex Ross Powless when he was born in Ohsweken back on Sept. 29, 1926. Though he was given the name Alex, it never really stuck. Ross didn't think fondly of the name and preferred to use his middle moniker instead. 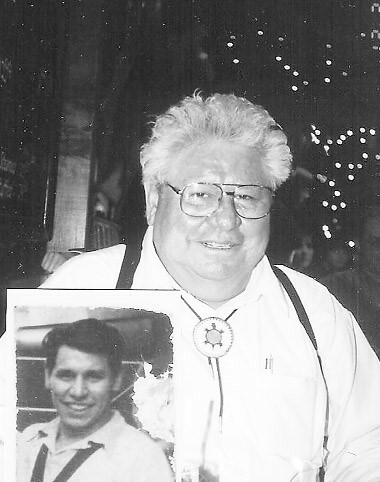 Born into a large family, Powless, the seventh and youngest child of Chauncay and Jessie Powless, would go on to have a considerably large family himself. During their 55 years of marriage, Powless and his wife Margaret raised 14 children. They also had 27 grandchildren and seven great-grandchildren. Their world was rocked way back in 1955 when son Victor died of pneumonia at age six months. The pair's first-born son, Gaylord, who went on to become a hall of fame lacrosse player himself, died in 2001. And then they lost yet another son, Greg. Early in life, Powless experienced the pain of losing a loved one when his mother passed away. Soon after, he was sent to a residential school in nearby Hamilton where he received his first formal education. He stayed there for five miserable years, said family members, who say he despised the experience. The children at the residential school had to do without many things, including food, and Powless yearned for his life back at home. Upon returning to his First Nation, Powless completed his Grade 10 studies before he left home again, this time to take an apprenticeship in carpentry. Before long, he became a carpenter. And not long after that he became a foreman for a carpentry firm. His smarts and people skills assisted in his quick ascension in the working world. Family meant everything to Powless. He stressed to all of his children the importance of being fit and involved with various sports. He also preached about the importance of getting along with people—all types of people. All of his sons played lacrosse. And though there was no organized league for women, some of his daughters would mess around with a lacrosse stick and ball, showing off their talents. Hockey, basketball and baseball were among the other sports the Powless children participated in and excelled at. But Powless wasn't only concerned about the athletic welfare of his own offspring. He was a driving force to bring youth lacrosse and hockey leagues to Six Nations. During the mid-1960s, he even spent a term as the president of the Six Nations hockey league. Both the lacrosse and hockey leagues continue to prosper and have produced various stars over the years. And his memory continues to live on since the Ohsweken arena was renamed in his honor. Powless had played an instrumental role in the construction of the arena back in 1972 as a member of the rink’s building committee. He was an avid gardener and enjoyed teaching his children their way around a garden. He was also an avid fisherman and enjoyed shooting pool and playing cards. He loved to read—everything. Gaining knowledge on a variety of topics was like breathing to him. That’s why his storytelling sessions could keep audiences, young and old, captivated for hours. When Powless was forced to give up his carpentry career because of wonky knees from years of playing lacrosse, he turned to another career. He became a housing inspector. He continued in that job until his retirement in 1991. Powless' community involvement included serving about a dozen years as a band administrator with the Six Nations band council. He also served on the Six Nations recreation committee. When family members knew the end was near for Powless, they brought Margaret, who has lived the past two years in a retirement home, to see him. The words exchanged between the two—how they loved each other and how that love could never die—brought tears to the eyes of family and friends.